신청자 수가 너무 많아서 서울 브레베 등록을 잠시 중단하였습니다. Due to an overwhelming number of applications, registrations for Seoul Brevets have temporarily been suspended! 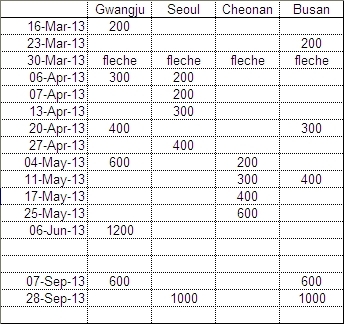 Korea Randonneurs offers an exciting 2013 Brevet season. We will run a full series out of Cheonan and Gwangju and, for the first time, Brevets will start in Seoul and Busan. A complete new 1200K will be run in Jeolla-do and the annual SBS will start both in Busan and Seoul. 한국 란도너스에서 2013년 브레베 시즌을 소개드립니다. 천안과 광주에서 시리즈 전체를 열게 되며, 처음으로 서울과 부산에서 출발하는 브레베도 생깁니다. 완전히 새로운 코스의 1200K가 전라도에서 진행될 예정이고 연례 대회인 SBS를 부산과 서울 양쪽에서 출발하게 됩니다.